You can search for content in Microsoft Stream from the top of any page with the Search box in the application bar. You can search for videos, channels, people, and browse groups. If you don't have access to a video, channel, or group it won't show up in Stream or your search results. 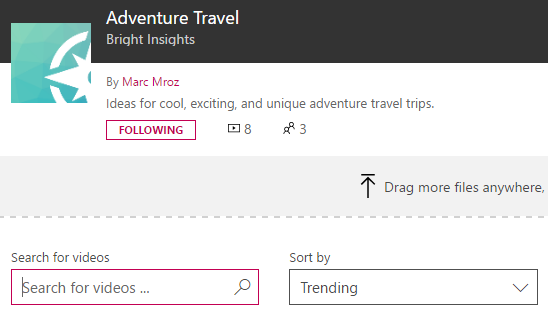 Type in a word or phrase into the Search box at the top of Microsoft Stream. Press enter or click the magnifying glass. Click Videos, Channels, or People to narrow your search results. For videos and channels, use Sort by to sort the results to further make it easier to find what you are looking for. We currently don't support searching for groups but you can browse groups and sort them to find the group you are looking for. When searching for videos, Stream finds videos based not only on the title and description, but also based on what's being said in the video. From the search results based on the transcript of the video, you can jump to the exact point in the video that has the information you are looking for. From Browse > Videos > Search for videos or the Search box at the top of Stream, type a word or phrase to search for. When you see video search results with a time code (for example, @00:10), click any of the lines to start playing the video from that specific point in time. If you are looking for a video in a specific channel you can scope your search just to that channel. Use the Search for videos search box on the channel page. If you are looking for a video in a specific group you can scope your search just to that group. Use the Search for videos search box on the group video page.